Our laboratory is located in the Terasaki Life Sciences Building at the University of California at Los Angeles. We are interested in how social interactions influence neural plasticity. To investigate this, we focus on the neural basis of vocal learning. Speech requires vocal learning, i.e. the ability to modify innate vocalizations in order to produce new ones. Only a handful of animal groups are known to exhibit this trait, with human speech and songbird song learning being the best-characterized. 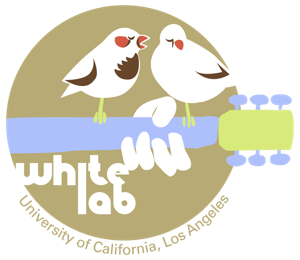 Presently, the lab uses the zebra finch, a songbird species and a well-established model of vocal learning, to investigate the neural basis of this important trait. We are part of the Department of Integrative Biology and Physiology that focuses its research activities on integrative physiology and systems biology. The Department offers its own Master’s degree, and a doctoral degree in Molecular, Cellular and Integrative Physiology in conjunction with the Medical School Physiology Department. In addition, predoctoral students can enter the lab through the Interdepartmental Program in Neuroscience, or UCLA’s Program in Bioscience.